I found the quote above in an interview clipped from a newspaper and tucked inside a book written by my Aunt Wylly. Finding it this morning was in a way like receiving a last gift box from her. 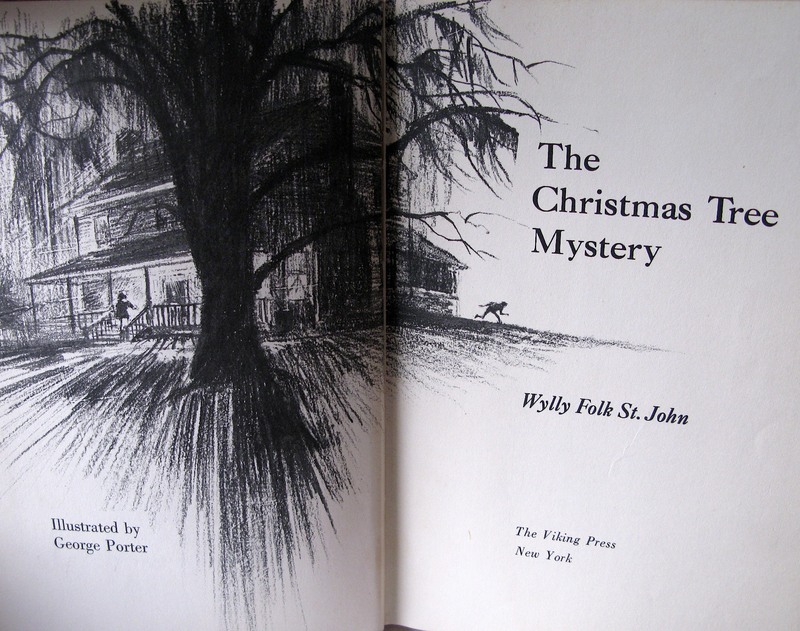 If you’ve spent any time on my blog, you will know that my great aunt, Wylly Folk St. John was a writer who while writing a great many things on a variety of topics, was most well known for her work as a children’s book author. As my grandfather’s only sister, she always remembered us with gifts at Christmas and on birthdays with each one seeming as if she had picked it out especially with us in mind. No gift box from Aunt Wylly was ever complete without a book and I always looked forward to seeing what kind of mystery was waiting for us. In addition to books, unusually wrapped gifts were stuffed into the scruffy brown boxes that always seemed too small to contain everything that came out of them. It was sort of like Mary Poppin’s handbag with more stuff coming out than could have possibly fit inside. As I grew older, I learned she bought gifts all year round and kept them in what she liked to refer to as her, ” Christmas closet. ” Once on a visit to her home in Social Circle, I saw her disappear behind an already closed door she had opened just enough to slip inside. After being gone for a few minutes, she returned carrying something that smelled like the packages that arrived twice a year. Well into our adult years, Margaret and I would talk about the excitement we had felt as children when a box arrived with Aunt Wylly’s familiar handwriting on the shipping label. Both of us would always do the same thing as the box was opened taking a deep breath and breathing in the familiar scent that we associated with our aunt. There was something dependable and constant about the way her gifts smelled the same every time and even though we couldn’t identify it completely, we later realized it was the scent of her home and daily life. This year as you may remember, I went back to what was Aunt Wylly’s cabin when she was alive. My cousins inherited it from their mother when she died suddenly last year and have made the tough decision to sell the cabin because it is no longer possible to keep it. While I was spending the day with them, I decided to share the story of the gift boxes, the Christmas closet, and the scent that was so special to me and Margaret. Not too far into my story, two of my cousins said in unison that the Christmas closet was the whole bedroom (which explained the constantly closed door) and they said that the the long unidentified scent that smelled like Aunt Wylly’s house was … can you guess … it was mothballs. So this year when I sent my Christmas package to my sister Margaret and her family in Alaska, I tucked a couple of mothballs into the shipping box overnight and then emptied it and left it open to air for a day or two. Then I wrapped up the gifts in the same way Aunt Wylly might have done with the kind of paper and string you see on discount in the value shoppers aisle. Just before I sealed it and shipped it, I took a little sniff and there it was again … Aunt Wylly’s house. I said nothing to my sister and when it arrived, she opened the box and told me later that the first thing she thought of was Aunt Wylly as the familiar scent of one of our dearest childhood memories drifted up from my box of gifts. At least twenty-five years after receiving the last gift box from Aunt Wylly, it made me smile to be able to share that again with Margaret and to know that the mystery has been solved. 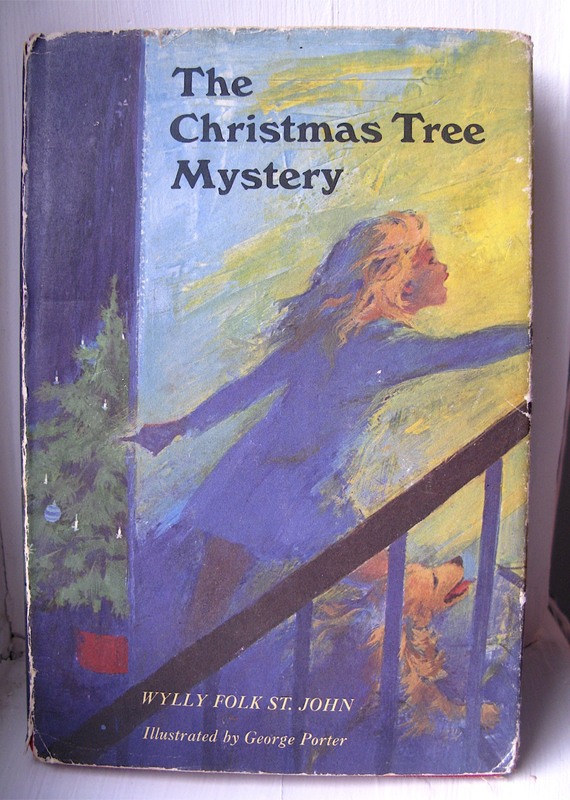 Speaking of mysteries, Margaret is holding a copy of The Christmas Tree Mystery, a book written by our aunt and one in which the key characters are modeled after the two of us. Like all of her books, it’s filled with clues, but this one has a plot which has Elizabeth trying to right a wrong after jumping to conclusions and Margaret doing all she can to support her so that together they solve the mystery. That’s supposed to be me on the cover with the light making my hair look blondish. My character has brown hair and eyes just as I do. 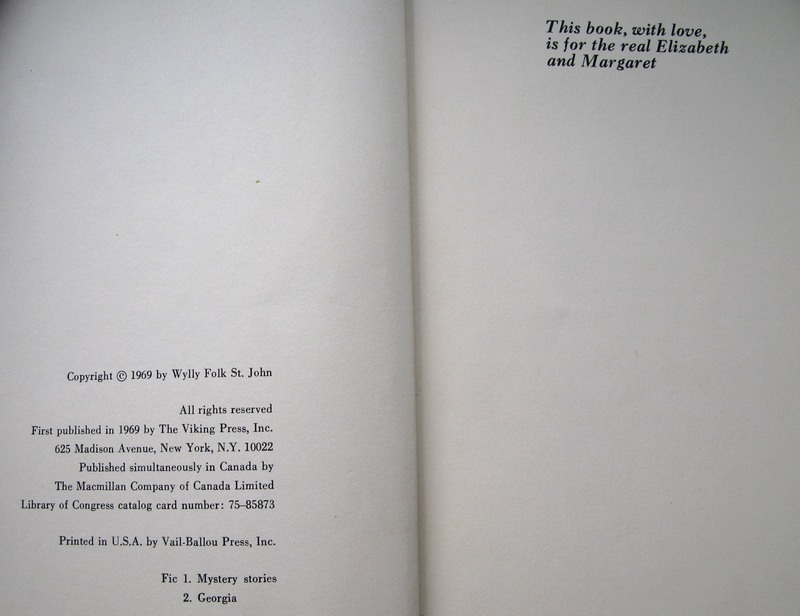 I always liked seeing the part about ” … for the real Elizabeth and Margaret, ” at the top on the dedication page. This page always makes me smile too. I include this page so you can see how little a 141 page hard back children’s book sold for in 1969. It seems as if you would have to sell a lot of books at $3.95 to make a good living doing it. 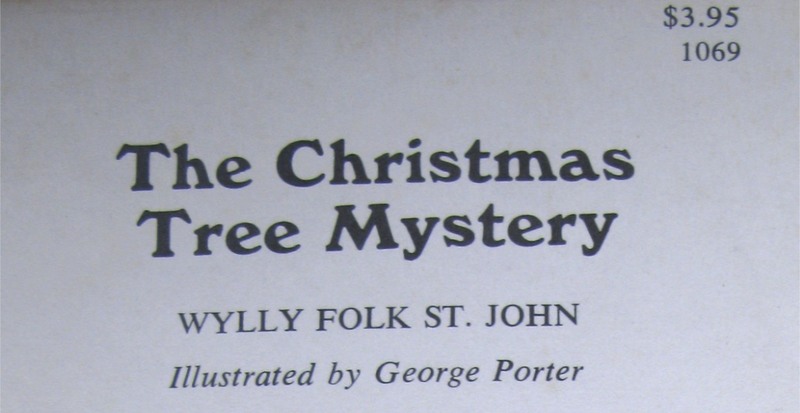 This entry was posted in Family, Love, Memories, Writing and tagged Elizabeth & Margaret, Gifts Of The Journey, Mothball, The Christmas Tree Mystery, Wylly Folk St. John. Bookmark the permalink. thanks for this one Elizabeth. I really enjoyed it. What a lovely story. She sounds like a great Aunt to have had. That dedication is sooo cool. I came across a copy of a book the other day I read as a child, it transported me away from home to a tunnel going under the sea (it was Enid Blyton so was undoubtedly based on Cornwall) that took me to an island where bad ‘uns were smuggling. That old sense of adventure engulfed me as I picked it up and flicked through it. What a thoughtful touch for you to add to Margaret’s package!!! You’re a good sister. The other day, I was listening to the morning radio show (not our local station) and the disc jockeys asked people to call in and confess what sick scents they loved. My answer: mothballs, of course. Thank you for honoring Grandma St. John in a way that captures the true essence of her spirit. Today, thank you for this happy reminder from my childhood, as well. This was the BEST Christmas blog post I read all season! What a beautiful memory of what sounds like a really special woman. wow, what a treasure your Aunt was. Your very own book, magical. Loved it. Yes, we did look cute. 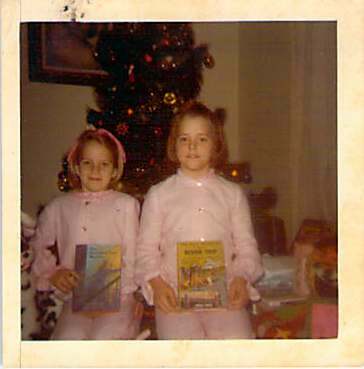 I remember those pajamas and the dark pink yarn ribbon I used in my hair. Your package totally reminded me of opening a box from Aunt Wylly … the oddly shaped items wrapped in various papers, the bottomless box, and of course the smell. I had as much fun pulling the presents from the box as I did opening them. that’s really sweet and special…it shows how little gestures can make a huge impact on kids. Thank you for sharing. How wonderful. Just the other day on a TV magazine show they were discussing nostalgia. And that of all the senses, smell memory was the strongest (even more than sight or sound). How true. I hope you and John have a blessed New Year. My fondest memories of childhood almost always include reading a book. I am eternally grateful that my parents always had a ready supply of good quality children’s literature on shelves where I could reach them, curl up in a corner and fall into a story. 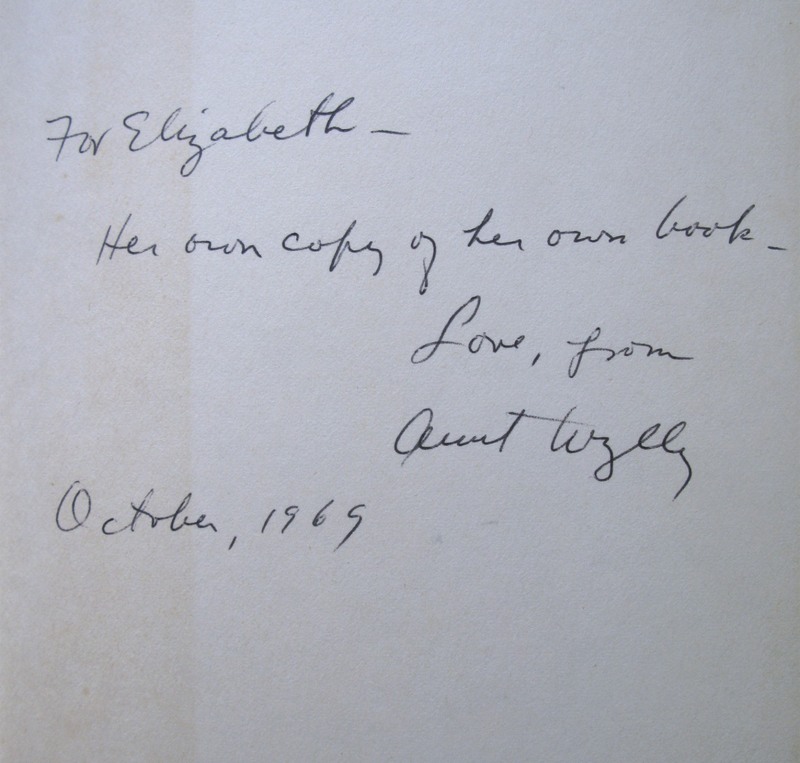 I have this book as well as 6 or 7 other your Aunt Wylly wrote. Although I did not know her personally, I grew up in Social Circle and heard about her and the books in school. I never read any of her books until recently. You and I appear to be approximately the same age. I graduated from high school with her grandson, and your cousin, Chuck. I also used to know his sister Jennifer, although she is a few years older. There is a stepbrother of Chuck and Jenny, Neil (Sonny), who is the father of my daughter’s really good friend. This is such a lovely story. Thanks so much for everyone’s kind words as well. Some people called her “Mrs. St. John” or Aunt Wylly and even Grandma St John. I called her Grandma. She was one incredible woman! She was way ahead of her time, so strong and fearless. I’ve always thought of her as being the first liberated woman. The picture you posted of her relaxing on the boat deck is the image I have in my “minds eye” of her great independence. She could go anywhere. Yes, she had especially picked out the gifts for both of you. But the christmas closet became the crafts room when she had part of the porch closed off. Great place to work on projects and hide gifts for any occasion. She used the mothballs to keep out the bugs and unwanted guest. She also used them in kitchen pantry. She hated those weevils that would show up in the flour. “Those damn bugs!” she’d say. Have you ever eaten anything that tasted like the smell of something else? I could taste the smell of mothballs, but NO ONE believed me. Yes, the smell memory is the strongest. I’m glad all the other rooms had a scent of it’s own.